Apple has introduced the first implementation of Intel's new Thunderbolt technology for high speed communications, aimed at providing a very fast new data connection for mobile professionals. Intel confirmed in a press release that Thunderbolt, "formerly codenamed 'Light Peak,'" is an "Intel-developed technology" that is "coming to market through a technical collaboration with Apple, and is available first on Apple's new line of MacBook Pro laptop computers." The new specification accommodates faster, simpler connections between devices, acting as a next generation FireWire but with speeds of up to 10Gbps, which Intel points out is fast enough to transfer a full length, HD movie in less than 30 seconds or to backup an MP3 collection large enough to play nonstop for a year in just ten minutes. That's 12 times faster than FireWire 800, and 20 times faster than USB 2.0. It's even twice as fast as Intel's USB 3.0 specification, which Apple hasn't adopted yet. Unlike just an upgrade to USB, however, Thunderbolt delivers the ability to daisy-chain multiple devices without using a hub. New MacBook Pros support six devices, such as one display and five separate peripherals, turning the professional notebooks into flexible, high powered workstations for video editors and other professionals just as Apple gets ready to release its new edition of Final Cut Pro. 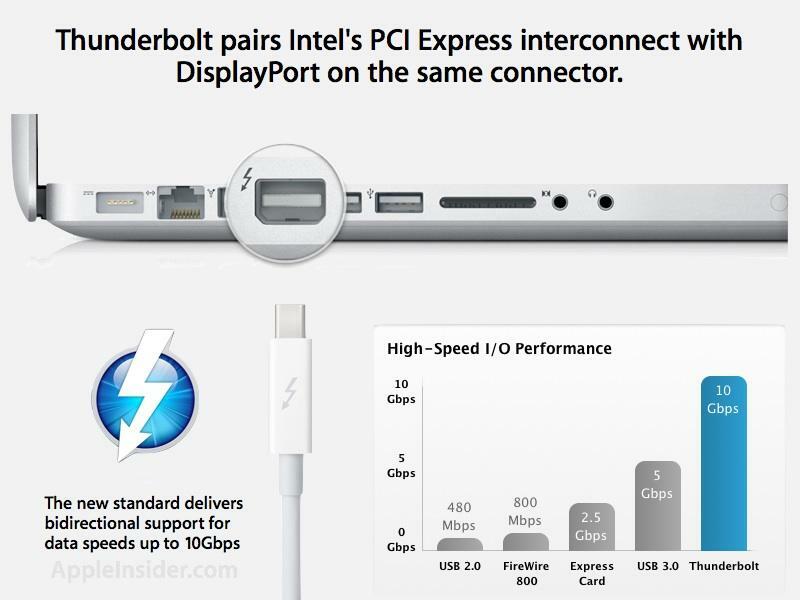 And rather than being an entirely new specification and port type, Thunderbolt's speed is based on Intel's PCI Express, a high speed serial interface typically exposed in desktop PCs as motherboard expansion slots (such as the Mac Pro, which features three x16 slots), but also appearing as Mini PCI Express cards (which is how Apple provides AirPort WiFi card support in the Mac Pro, iMac and its notebooks). Apple's Thunderbolt pairs the PCI Express standard for a high speed interconnect with the existing Mini DisplayPort, using the same physical connection, adding a very high speed path for data without adding yet another port. DisplayPort itself continues to support existing DisplayPort monitors as well as DVI/HDMI and VGA video output. But when connected to new Thunderbolt devices, it can support very high speed data transfers to devices such as RAID arrays. The specification also supports electrical power for bus-powered devices, and streams data in both directions with dual channel 10 GBPS speeds. Essentially, Thunderbolt is like a fast new FireWire but it's based upon Intel's PCI Express, which is already widely used as a peripheral controller. This makes it both familiar and cheaper to support by drive and other device manufacturers. Further, Intel already includes PCI Express support in its mobile and desktop chipsets, so it's easy to add to new systems. What's really new about Thunderbolt is Intel's switching technology that manages both high speed DisplayPort signals and high speed PCI Express signals on the same wire, something that the company is now building into a standard controller that will make the new Thunderbolt cabling system easy and affordable to adopt. Bob Mansfield, Apple's senior vice president of Mac Hardware Engineering, said "we're thrilled to collaborate with Intel to bring the groundbreaking Thunderbolt technology to Mac users. With ultra-fast transfer speeds, support for high-resolution displays and compatibility with existing I/O technologies, Thunderbolt is a breakthrough for the entire industry and we think developers are going to have a blast with it." Apple originally developed FireWire in the early 90s as a peer-to-peer high speed serial replacement for parallel SCSI, with the intention of delivering both fast disk access and streaming audio and video data. Intel later developed USB as a low speed serial peripheral standard. Apple helped broaden adoption of USB by implementing it as the only serial port on the original iMac. However, Intel's release of USB 2.0 brought it into competition with FireWire on the low end, disrupting the adoption of FireWire with a port capable of fast enough basic external disk access, but incapable of supporting the point-to-point features of FireWire and susceptible to contention among devices that slow the entire bus. While USB continued to become cheaper and ubiquitous, FireWire remained more expensive because devices that use it require more expensive and sophisticated controllers. Other standards for faster disk access have appeared, including External SATA, which Apple hasn't ever implemented. By adding Thunderbolt to its MacBook Pros and other systems, Mac users will gain a new leap in disk access speeds and be able to connect to ultrafast new audio or video-centric break out boxes for professional use. The new standard should also be simple to implement at low cost. Additionally, the PCI Express design of Thunderbolt makes it straightforward to add FireWire or USB interfaces to a device that is connected via Thunderbolt, eventually enabling Apple to drop other connectors from its equipment while still allowing users to continue to use their existing equipment.